While the upcoming centenary of the start of the First World War will see lots of books published, there are plenty of other histories that you might like to read during the holidays, which we have in stock. 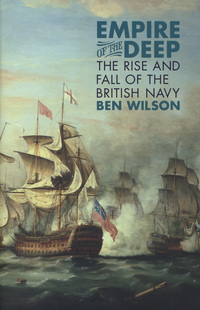 Empire of the Deep: The Rise and Fall of the British Navy by Ben Wilson ‘The story of our navy is nothing less than the story of Britain, our culture and our empire. Much more than a parade of admirals and their battles, this is the story of how an insignificant island nation conquered the world’s oceans to become its greatest trading empire. Moving from the sea to the sky, Falling Upwards: How We Took to the Air by Richard Holmes is about the pioneer generation of balloon aeronauts, the enigmatic group of men and women who risked their lives to take to the air (or fall from the sky) and so discovered a new dimension of human experience. Another book filled with passion and personal interest is Under Another Sky: Journeys in Roman Britain by Charlotte Higgins which was shortlisted for this year’s Samuel Johnson prize walks us around the landscape of the country as it would have been 2,000 years ago and captures the spirit of Britain now, Britain then and Britain in between. The turbulent 18th century is the subject of The First Bohemians: Life and Art in London’s Golden Age by Vic Gatrell In the teeming, disordered, and sexually charged square half-mile centred on London’s Covent Garden something extraordinary evolved in the 18th century. It was the world’s first creative ‘Bohemia’. The nation’s most significant artists, actors, poets, novelists, and dramatists lived here. Drawing on a vast range of sources, Gatrell shows the deepening fascination with ‘real life’ that resulted in the work of artists like Hogarth, Blake, and Rowlandson and literary works like The Beggar’s Opera and Moll Flanders. The 19th century is the setting for Perilous Question: The Drama of the Great Reform Bill 1832 by Antonia Fraser who brings the rogues and heroes of Victorian Westminster to life, telling a lively story of human drama and political intrigue. This can be read with High Minds: The Victorians and the Birth of Modern Britain by Simon Heffer a huge, deeply researched book about the formative decades in our modern history. Catastrophe: Europe Goes to War 1914 by Max Hastings answers how World War I could have begun. Ranging across Europe, from Paris to St. Petersburg, from kings to corporals, he traces how tensions across the continent kindled into a blaze of battles. 100 Days to Victory: How the Great War Was Fought and Won Saul David shows vividly how the First World War reached beyond the battlefield, touching upon events and lives which shaped the conduct and outcome of the conflict. Ranging from the young Adolf Hitler’s reaction to the assassination of Archduke Ferdinand, through a Zeppelin raid on Scarborough, the tragic dramas of Gallipoli and the battlefields of the Western Front to the individual bravery of the first Indian VC, he brings people and events dramatically to life. The Bombing War: Europe 1939-1945 by Richard Overy is the ultimate history of the Blitz and bombing in the Second World War, from the Wolfson Prize-winning historian and author.